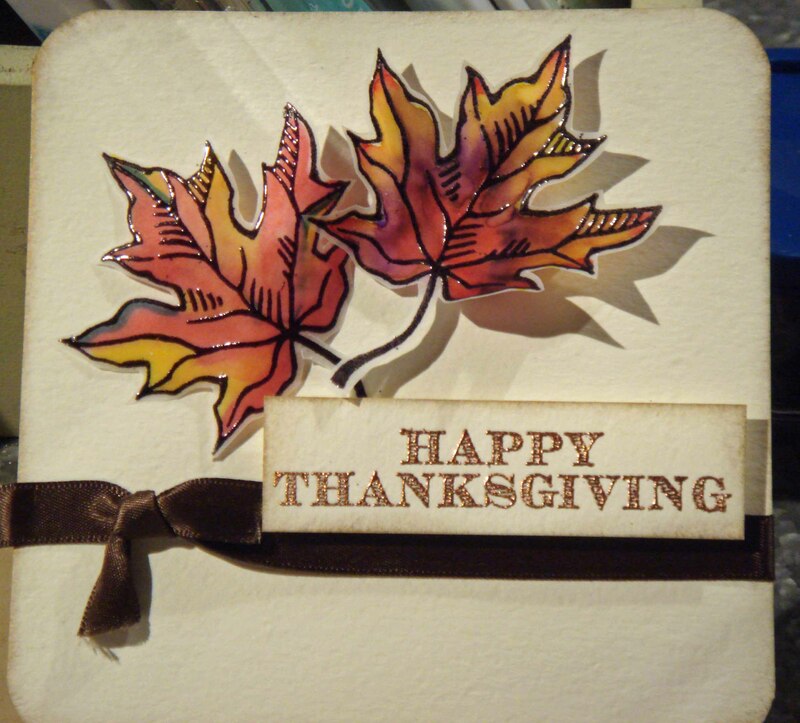 The fun part about this card was making the leaves. I black embossed the leaves on vellum, colored with Tombow brush markers and blended the ink with a water brush. When I dried the ink with my heat tool, the vellum curled. A happy accident. The leaves were attached with foam tape. (The card has weird shadows on it — those spots are not on the actual card.) 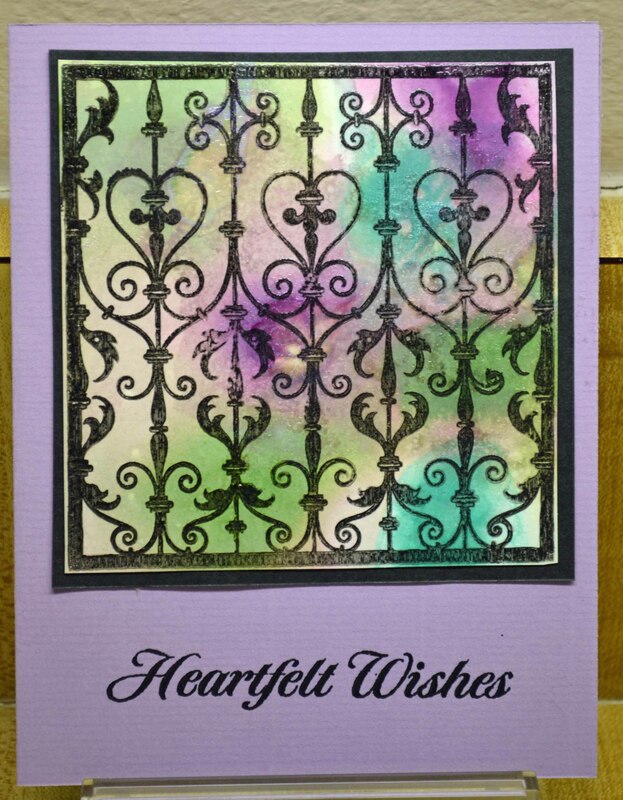 The sentiment was embossed in copper; the edges of the card were distressed with copper ColorBox pigment ink. All the supplies are from The Paper Source. The paper is the store’s Luxe White, which has a slight texture to it. I am grateful for so many things, and everyday is a gift. I am sending warm Thanksgiving wishes your way. … and by seasonal distress I don’t mean the anxiety kind! 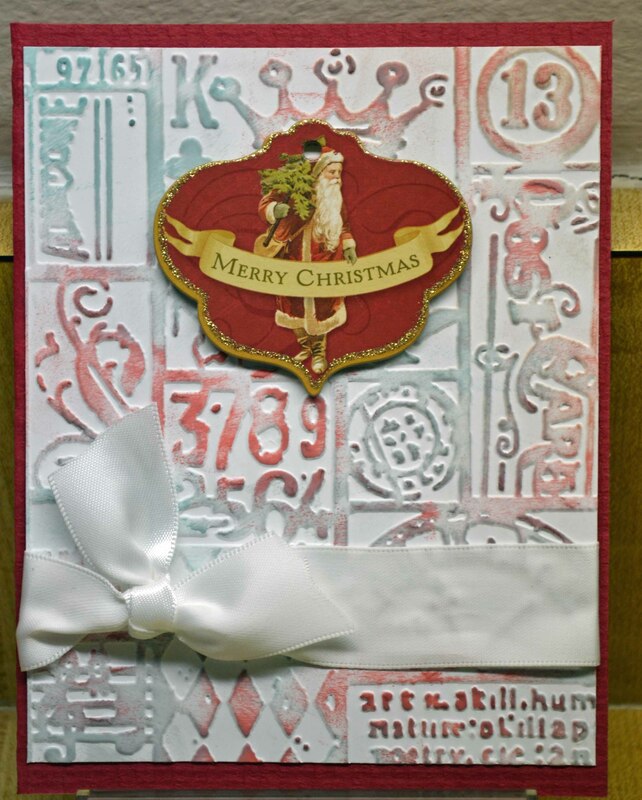 I mean the Seasonal Distress Inks produced for a limited time by Ranger and Tim Holtz. 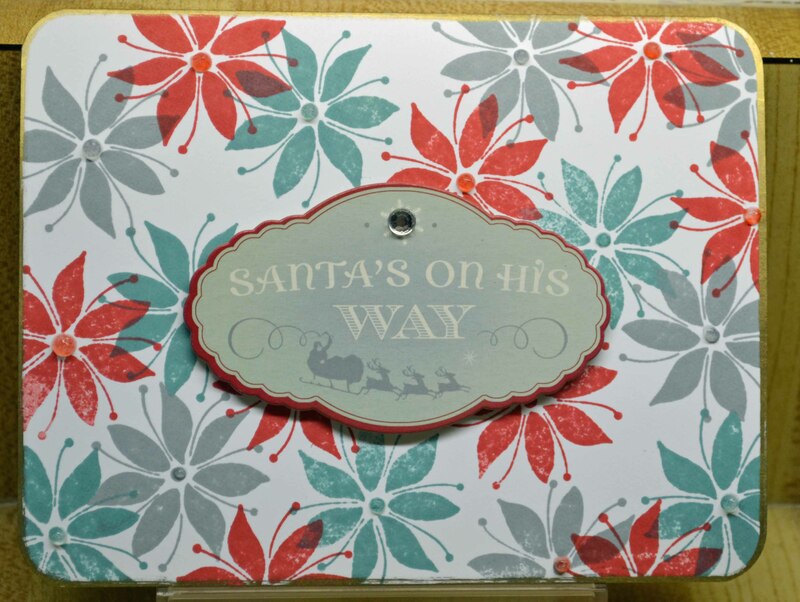 I ran a piece of glossy scrap card stock through a Cuttlebug folder and rubbed it with the Distress winter inks: festive berries, evergreen bough and iced spruce. The piece was trimmed, edged in gold, be-ribboned and attached to a red card. 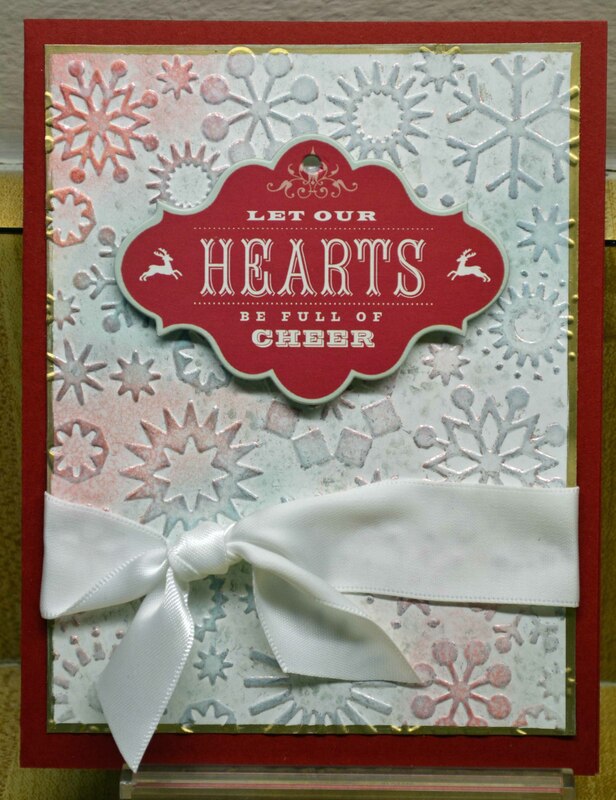 The chipboard sentiment is from a Brenda Walton K&Company box ‘o chips that I got A YEAR Ago (gasp) and was hoarding until the right moment. That moment is now. 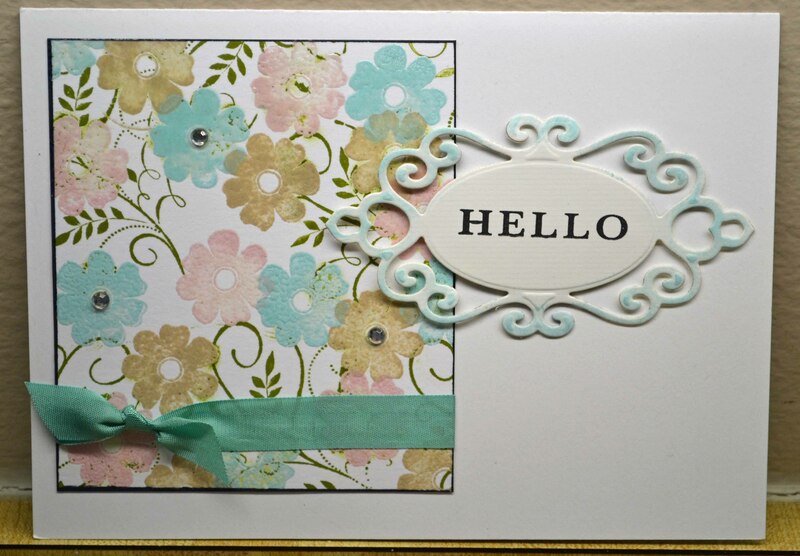 Another Cuttlebug-embossed background (a collage background from Tim), same process. Could I have gone any simpler? This is so plain it’s a little embarrassing and kinda dorky. But how fast and easy was this? (You can’t see it very well, but the poinsettias (Hero Arts) are dotted with Distress Rock Candy Stickles. A while ago a reader asked for some tips on using Tsukineko’s Ink Potion No. 9 (anyone else want to hum the song “Love Potion No. 9″?). I did a little research on the product, but the best way to undestand the product is to play with it. The Potion is a blending solution that works with water-based ink – think of how you use alcohol blending solutions with alcohol inks. No. 9 is touted as making paper less likely to curl, although I have found the curling depends a lot on the type of paper you use. The piece in the upper left hand corner is watercolor paper. For that one, I spritzed No. 9 on my craft sheet, added re-inkers and plopped my cardstock on that. The watercolor paper gives it a very different look, much more subtle. I think the one above is my favorite. I stamped Hero Arts’ gate stamp in black pigment ink, then clear embossed. For my next experiment I used the Potion as I would use alcohol blending solution. I dropped inks onto my felt pad dabbing tool, spritzed it with Potion and dabbed it all over my cardstock. I stamped my images using StazOn. To be cut out and used at a later date! 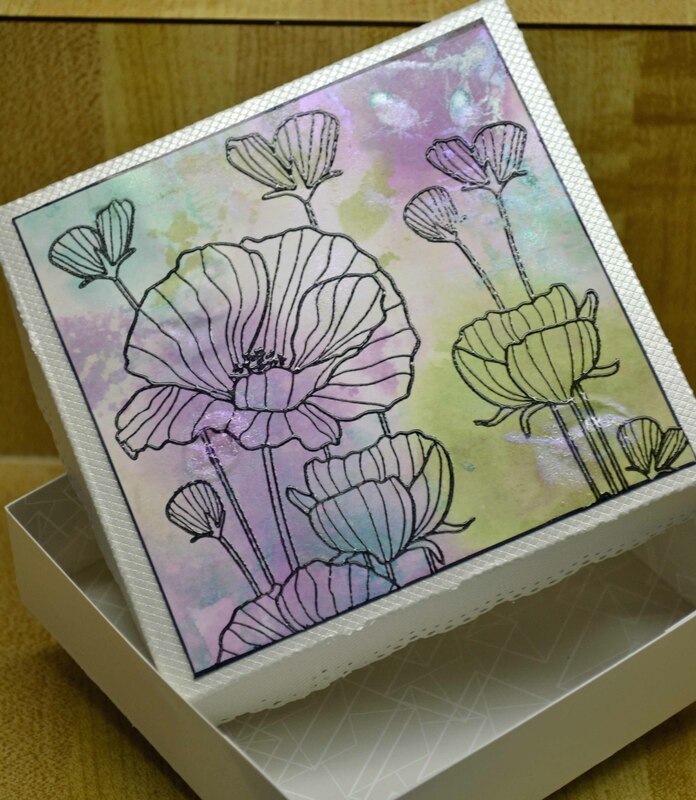 — Stamp with water-based ink, then spritz to get a soft, watercolor-like blend. — Spray on an inked stamp for the same effect as above. 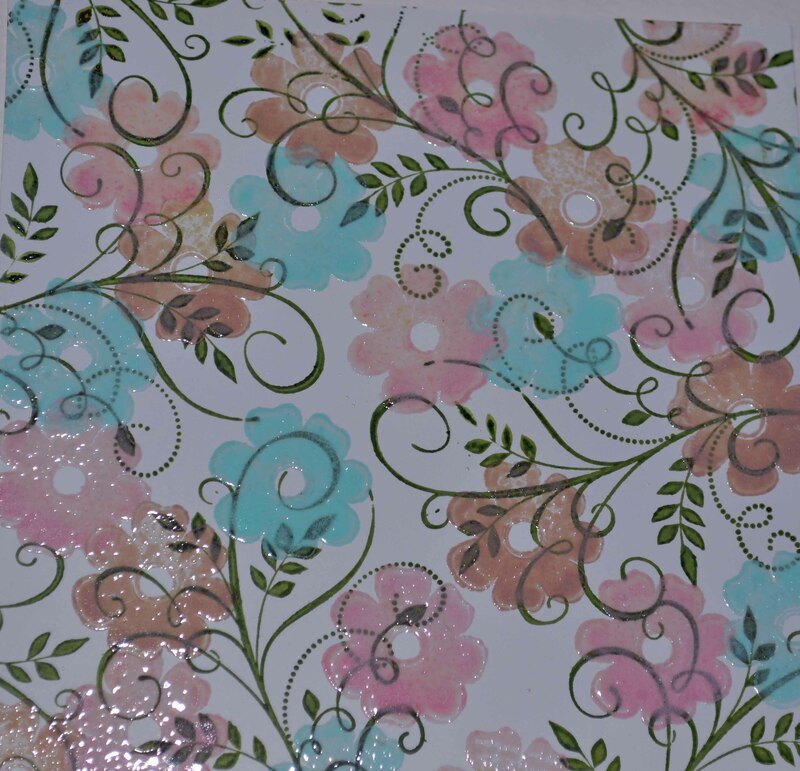 — Mix with water-based ink (re-inkers) and then spray on your project for backgrounds. This is especially nice if you use a sparkly re-inker. — Apply to a stamped image with an applicator, such as Tsukineko’s Fantastix, to blend specific areas. — Ink up a brayer, then spritz with Potion to help blend the ink and give a smoother application. — Spritz it first on your paper, then stamp. 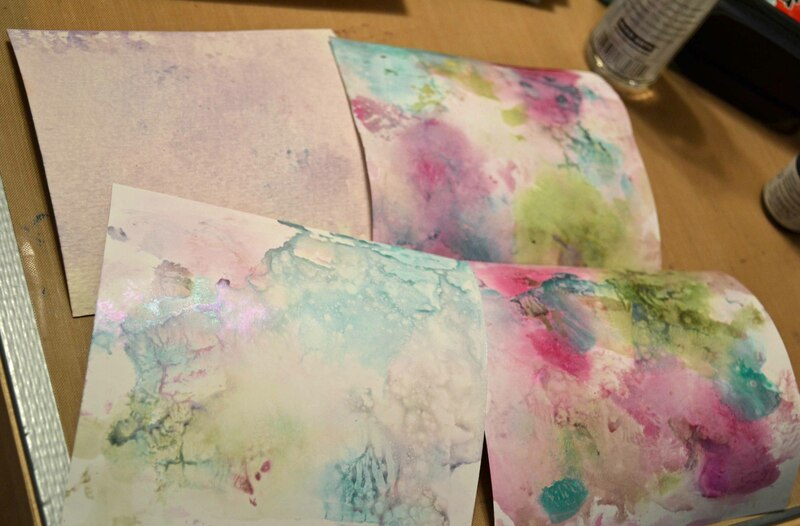 — Drop ink (from re-inkers) on a craft sheet, then spray with Potion. 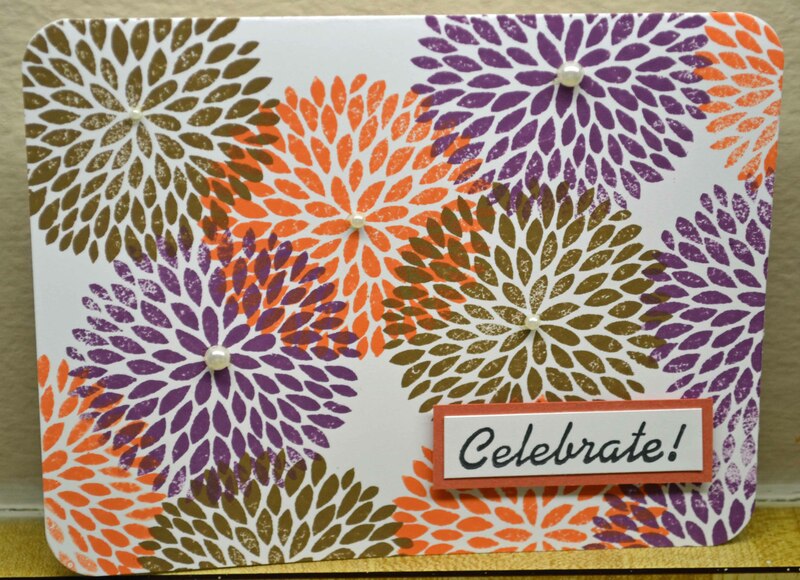 Drag card stock or press card stock into the mixture for colorful backgrounds. – Use to blend watercolor crayons and pencils. Have fun, and let me know how YOU use this blender! Are you tired yet of my mixed media natterings? 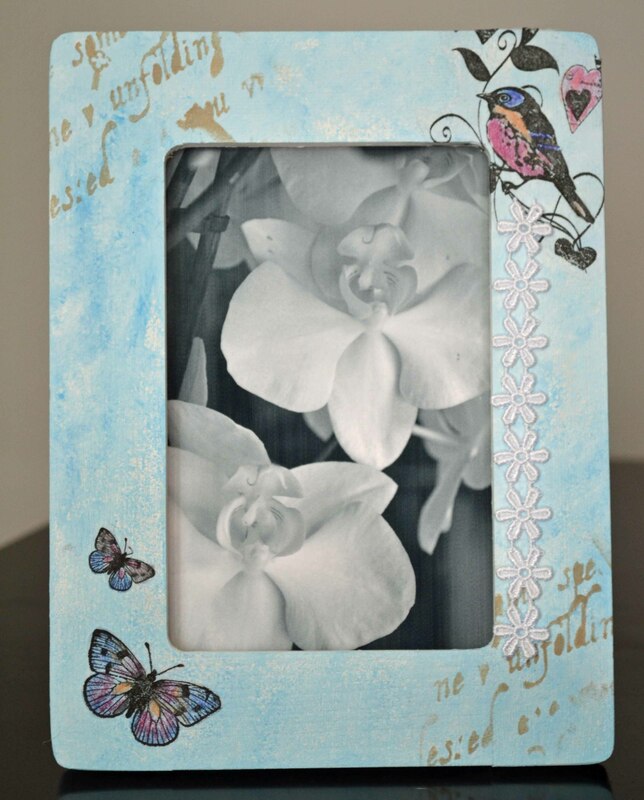 This wooden photo frame was covered with gesso and blue acrylic paint. I painted it first with white gesso, then mixed a dab of blue paint into my gesso and sponged that on for added depth (letting some of the white show through). 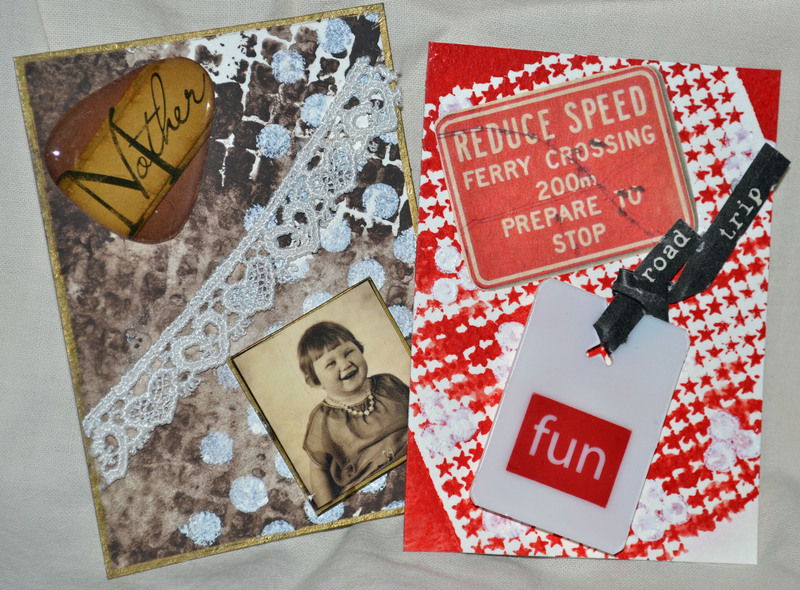 When dry, I used a stencil (Crafter’s Workshop) and an ink pad for the text fragments. 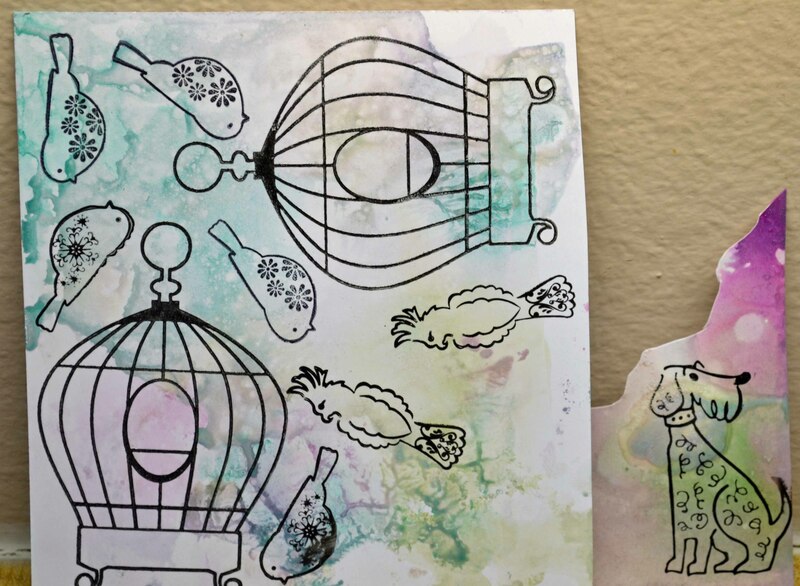 The birds and butterflies were stamped on tissue paper, tinted with colored pencils, cut out, then glued to the frame (with Mod Podge). The lace fragment was adhered with Zip Dry glue. 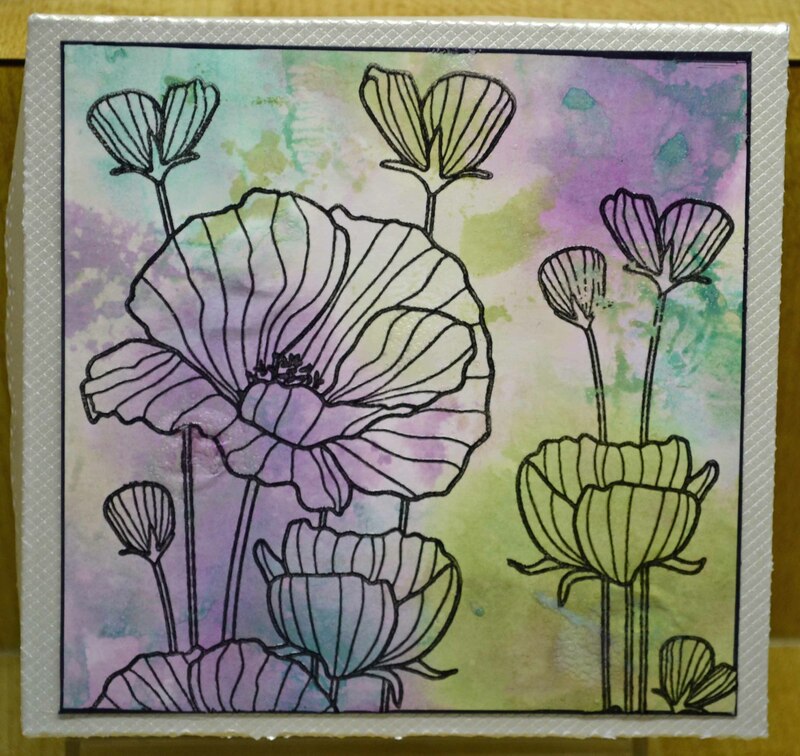 Artist Trading Cards (ATCs) are great ways to play and learn about various techniques and media. Here are some I made using the techniques found in “Artist Trading Card Workshop” by Bernie Berlin. I loved this book because of the various techniques. The cards were made during an on-line workshop with the Yahoo group Artists of the Roundtable. Close-ups of two other ATCs done with inks, acrylic paints, etc. Aren’t these colors yummy? (Well, maybe they don’t look as bright and glistening in the photo as they do in real life … you’ll have to trust me, they are yummy!) 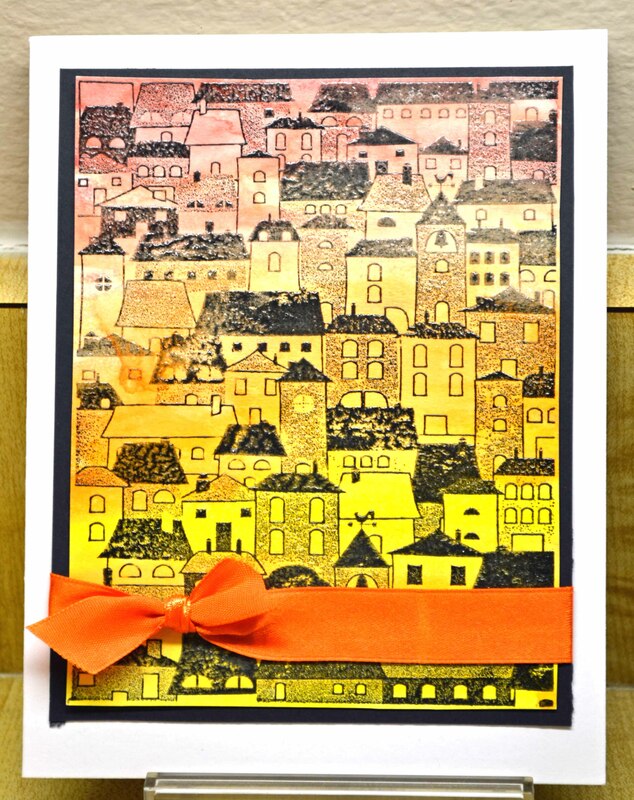 The background was made using Faber-Castell’s Gelatos — creamy crayon-like pigment sticks. The next card uses Donna Salazar’s Mix’d Media Inx, which I talked about in the previous post. 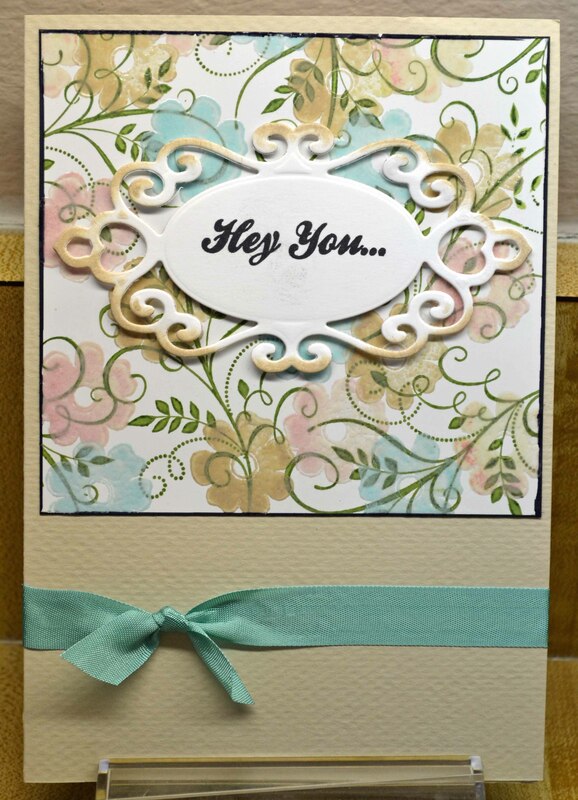 The edges and the sentiment (Hero Arts Anytime Messages CL129) were inked with Stephanie Barnard Dye Inks from Clearsnap. Thanks for spending this time with me! Mixed media art — ah, the name conjurs up some complicated art process. 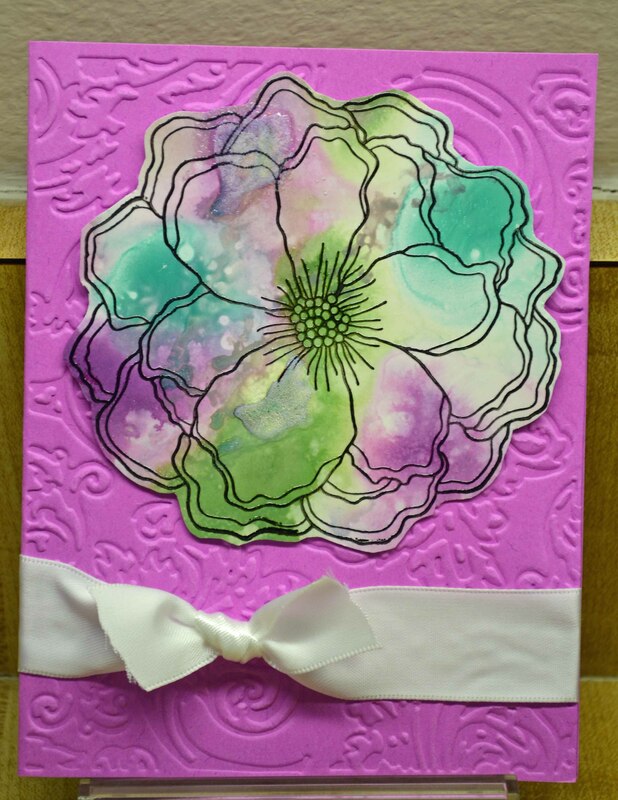 But if you’ve ever layered paper on a card, used several types of ink, or varied your cardmaking techniques, you’ve created mixed media art. See? Wasn’t that easy? I did a little mixed media exploring for an article in the December issue of Crafts ‘n things magazine (the one that is on the newstands now.) I thought I’d share some projects that did not make it into the magazine. 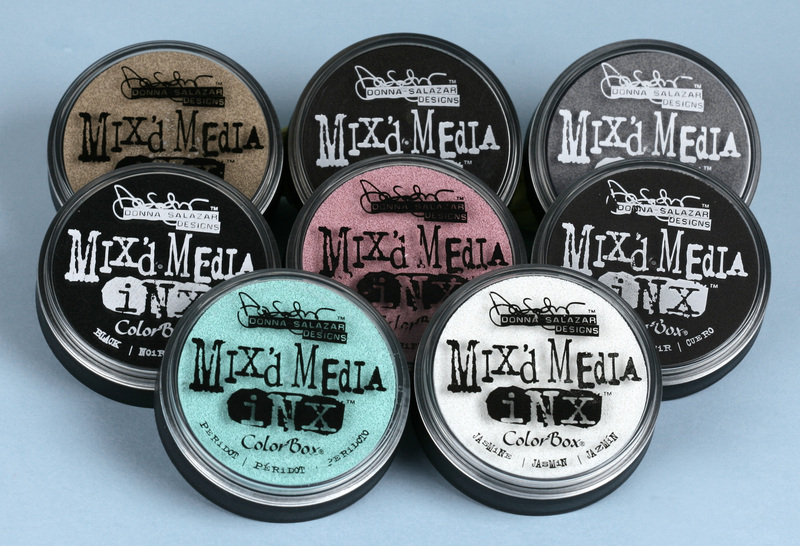 First are my experiments using Mix’d Media Inx, a new pigment ink from designer Donna Salazar and Clearsnap. The ink is thick and creamy and comes in a round, stackable container that is somewhat flexible. 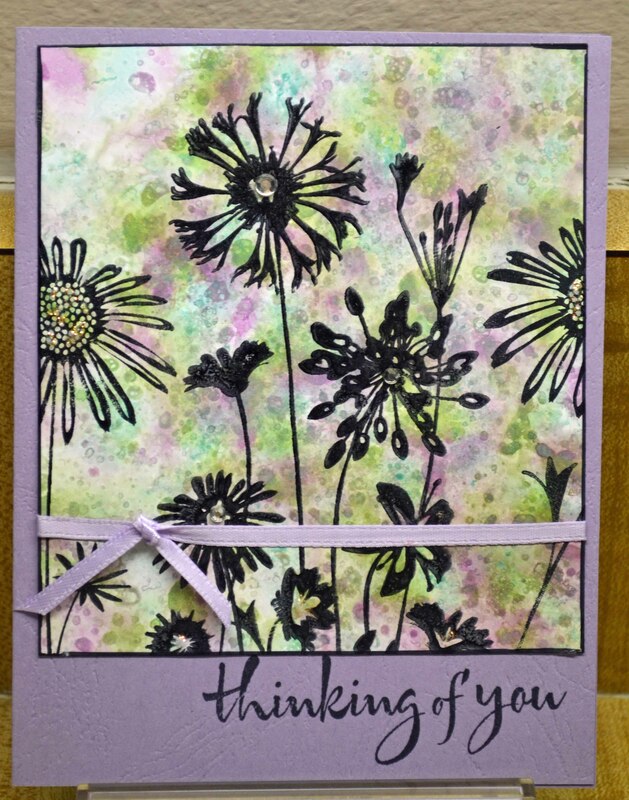 On the one above, I stamped the vine pattern first, using the fast-drying dye ink, then stamped the flowers using the Mix’d Media Inx. (All stamps: Hero Arts.) I embossed with clear powder. Note how the dye ink shows through. 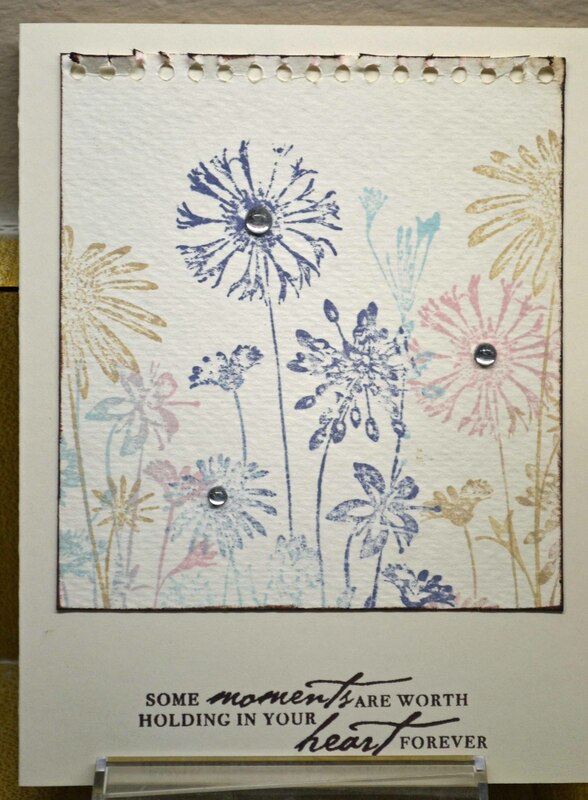 It’s okay, but it wasn’t quite the look I wanted, so I also tried embossing the flowers first, then stamping with the dye ink. The above uses that piece that was stamped with the vine and dye ink first, then the Inx, and embossed with clear powder. (Spellbinders die; Technique Tuesday sentiment; Martha Stewart ribbon). I also rubbed a bit of the Inx on the die cut to give it more definition. Same process, but I let the ink dry longer, then rubbed it off the embossed flowers. I’ll have more in another post! Thanks for coming by.